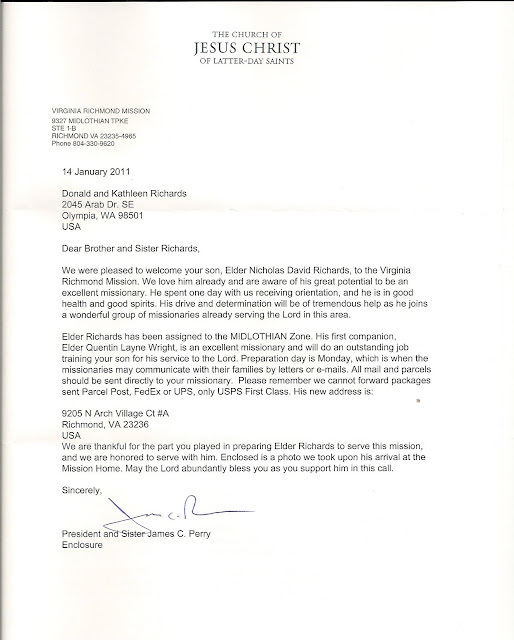 Letter from Elder Richards to Mom! It's so nice getting your letters! I really do enjoy reading them. It always makes my day when I get ANY sort of mail. Thank you for all your love and inspiration and scriptures that you've been sending. My heart just fills with the Spirit when I read the scriptures you send me. I'm so grateful for the love you have for the gospel and for the dedication you have for the work. I think it's awesome that you are so sensitive to the Spirit and I really admire that. I'm grateful for all that you teach me; like the mothers who taught their 2,000 stripling warriors. Being here on my mission, thus far has been great. I know that by the whisperings of the Spirit the Lord will be there for me and for you. I know that whatever trials we may have the Lord will lift us up. 2 NE. 4:20 "My God hath been my support" and seeing you throughout the years I know that the Lord will support you. Thank you for teaching me righteous principles and know that by the Spirit that I will be safe. Thank you for that hymn #98. Earlier that day I felt the Spirit wanted me to listen to it, even before I got your letter. I know that you felt the Spirit or that wouldn't have happened. Thank you for your prayers and support. Thank you for being on the straight and narrow path. I love you always! My mission president is AWESOME. He and his family treat us missionaries as their own kids - so it's nice! I'm so glad that you write me Dad! I think of Moroni and his relationship he had with his Dad! I look so forward to your letters and emails! I'm so STOKED that Jacob Klumker is finished with his papers! That's so cool! He's going to LOVE it! My trainer is nice; his name is Elder Quentin Wright and he's from the tri-cities area in Washington. Our bishop here says "it's as common as a 3 dollar bill" - ha! ha! Pretty rare! Well, I wish I could write more meaningful emails but I'm working on the letter part - so I'll be sending you more of my adventures soon. For now we are teaching some baptist preachers and an English Major professor - who's questions are all over the place! The food here is normal but all the shops are different. Ha! ha! I'm serving in the Midlothian area and hopeing you mark on the map where I'm at and then I'll send you pictures. This place has more trees than Washington and all the people are pretty nice for the most part. I'm just freezing though at night! Be sure to send me your mission stories and successes - the more the better! :-) Well, I'm going to write the girls! I love you Dad, remember that! I'm always thinking of you daily. Well, I'm serving in the Midlothian ward area next to the mission office; so that's where all the mail will go, so just use that address. : ) I think it is so good that you're having events over at the house! The more service the more blessings! My trainer is great! He's 19 and he's been out 8 months. His name is Elder Wright and he's great and the people here are really nice too! Last night the rain froze and almost all of the cars were frozen - LOL! - but it's nice out here! I'm always looking for letters of mission stories, inspiration and hope and just good stuff that's happening at home! I haven't heard from Laura or Amanda. I really miss them and am thinking about ALL of you everyday! I'm in a car area driving a chevy malibu. It's pretty cold here! The roads here are really messed up even more than Washington. 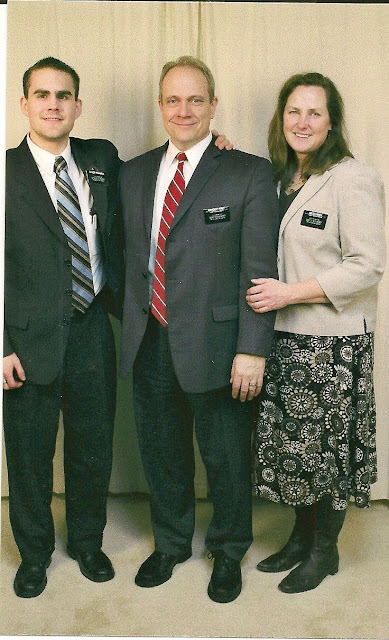 The AP's are really nice and my mission president is like a dad and his family is really nice too! He's AWESOME! He really will help me on my mission! He's open to the Spirit very much!! So it's good! I really love you mom! Tell Chelsea Stine in the single's branch that I said hi! I really don't have time to write a bunch of letters alot! Sorry and please be sure to remember my name in the temple. I always think of you and dad and the whole family so much. I love you! Week of January 24th - Lots of news this week! We've received lots of mail and news this week! 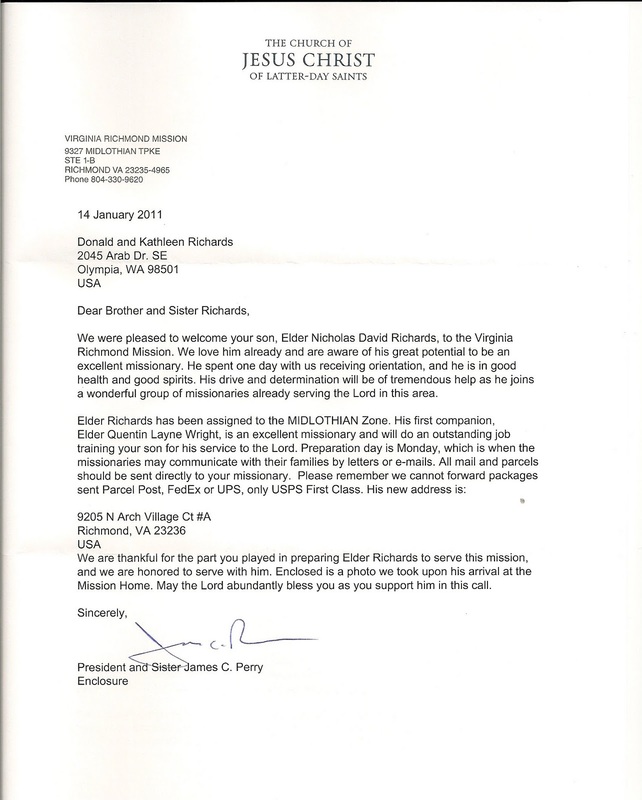 We received a letter from Nick's mission president Pres. James Perry. The picture below was taken after getting up at 3:00 a.m. MST earlier that day. It had been a long day - plus flying on 2 airplanes - which was also a NEW experience for him. I was lucky enough to be home when he called from the Detroit airport where they had their layover. Picture was taken on 12 Jan. 2011 after Elder Richards arrived at the Mission Home. Hey Mom and Dad! I'm here in Richmond, Virginia and it kind of looks like Washington. My mission president is really nice. I've got a little bit of jet lag; but other than that I'm O.K....a little nervous so keep praying and send lots of letters. I've been fed and the food is good. I love you and can't wait to hear from all of you. The letters help - they REALLY DO! :-) So keep praying for me and if you can, it would be nice for you to put my name in the Temple. I really appreciate all the love from you both. If you could also pray for my companions too, so that things will run smooth. Well I LOVE you all and like I said, don't hesitate to send more letters. Haven't heard from Elder Richards yet....but his mission home called to give us his new address. He is currently going to be serving in Richmond. His is the Midlothian Zone. His new companion's name is Elder Quentin Wright. Monday is their P-day but because it is a national holiday today she said they won't be able to get their mail until tomorrow or send emails until tomorrow! As soon as we hear anything I'll be sure to post it on here! !